Spread one heaped tbsp of sugar on each bacon rasher, rubbing it in on each side with your fingers. Lay out flat and cook for 10 minutes, turn and lay flat and cook for 10 more minutes. Take each slice out and lay on a buttered plate or greaseproof paper and allow to cool. Heat the cream until it just shivers, if you boil it it will change the taste and be too hot for the chocolate. Add the chocolate off the heat and stir in to melt, and add the bourbon add bacon. Stir in and leave to chill in the fridge for 2 hours until solid. 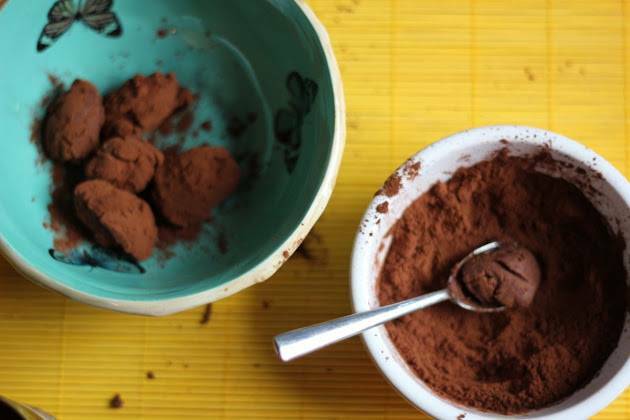 Put the cocoa on a plate and scoop out your truffles with a teaspoon. Roll them in the cocoa and chill. "Shamballa Bracelet By Cutey Review…"
"22/03 Link Up Your Favourite Posts This Week : Welcome To The Weekend Hop …"